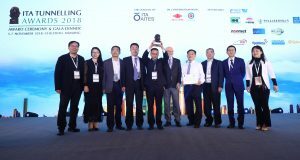 During the International Tunnel Association (ITA) Annual Awards Ceremony in Chuzhou, Anhui Province, China on 7 November 2018, the Hong Kong Zhuhai Macau Bridge (HZMB) immersed tube tunnel won the International Tunnel Association’s “2018 Major Project Award”. Nearly 30 tunnel projects worldwide entered the short list after the first-round selection. 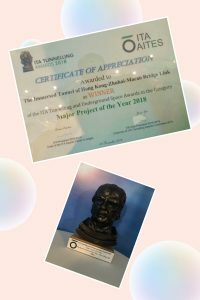 The Immersed Tunnel of the HZMB became the Winner of the prestigious ITA Tunnelling and Underground Space Awards in the category “Major Project of the Year 2018”. Since 2008, Tunnel Engineering Consultants (TEC) was the key consultant to the Client Organization HZMB Authority for design and construction consultation of this immersed tunnel including the artificial islands that provide the transition from the tunnel to the bridge sections on either side. 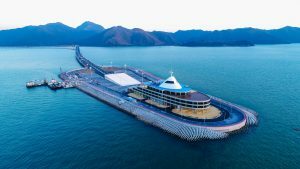 TEC reviewed all designs of the immersed tunnel and artificial islands, performed parallel analyses and special studies for critical design components and carried out monthly special inspections during construction.